Water Tanks. Water is essential for healthy living...clean water is even better! Select Home Services can clean and provide a number of Water Tank related services. Select Home Services provide these services for all types and sizes of water storage tanks, retention tanks, concrete & plastic water storage tanks, patio water storage tanks, square tanks, lined water tanks…if you have it chances are we can clean it. How does a water storage tank work ? A water storage tank is a tank placed on a property which collects rain water that lands on your roof and then goes into the guttering and through pipes into your water tank. Your water pump then supplies your home with water from this tank/s when you need it. Therefore anything that gets onto your roof or into your guttering ends up in your water tank. So, if your water tank is not cleaned it can be filled with leaves, soot, dirt, silt, bird droppings, dead birds, rodents and thier droppings which all builds up into a sludge at the bottom and can cause the water to taste funny, dis-colour and of course can cause illness and tummy bugs. How does a water retention tank work ? 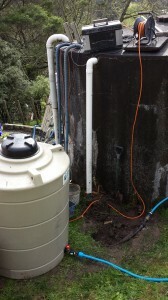 A water retention tank is a tank placed on a property which collects rain water that lands on your roof and then goes into the guttering and through pipes into your water tank. This water is then used to supply your homes laundry water and toilet water supply. So, if your water tank is not cleaned it can be filled with leaves, soot, dirt, silt, bird droppings, dead birds, rodents and thier droppings which all builds up into a sludge at the bottom and can cause the water to taste funny, dis-colour and of course can cause illness, tummy bugs and even stain or discolour your washing! Water storage tanks and retnetion tanks should be cleaned every 2 – 3 years depending on your immediate environment. So if there are alot of trees and bushes around chances are your water tank will build up sludge faster than a property that does not. Not having your water tank cleaned and inspected on a regular basis can lead to any number of issues…discoloured water,tummy bugs such as e-coli, cholera, diarrhea, to name a few, unessessary repairs which can lead to: unwanted loss of water due to unnoticed leaks, weaping and overflowing. People spend hundreds of dollars per year cleaning thier pools and only swim in them! Why not have your drinking water tank cleaned every couple of years for a fraction of the cost??? Select Home Services use an energy efficient cleaning system that removes all the unwanted sludge and muck at the bottom of your water storage tank, but will only use up 10 – 15% of your water! Plus you do not have to listen to a noisy petrol pump rumbling away while we do it! This system is brilliant to use during winter or whenever your tank is full. At the end of this process our technician can also steralise the water in the tank to remove any bacteria in the water supply and also any that has built up on the walls and base of the water tank. You could be drinking this!!! For a drain and clean Select Home Services actually climb into your water storage tank and scrub and rinse the walls of the water tank thoroughly and pump all remaining water and muck out. Then you can simply wait for mother nature to refill your water tank for free or call a water supplier to come by and fill your tank for you. This is always a good thing to do as water suppliers will put some town supplied water into your water tank and the chlorine in this water is great for steralising any bacterias that are present in the water tank, and if you have a water filter system installed which removes chlorine you dont have to worry at all! Absolutely no chemicals are used in this process just water! This is an excellent cleaning process to use during the summer months when your tank gets low, just give us a call when you know your water level is getting low in the tank and we can come by and use the remaining water to clean the water tank thoroughly and you can get your tank refilled knowing there is no longer any sludge and muck present anymore. So give us a call when your water level is low select home services can clean your water tank so you know your fresh new supply of water is not going to be contaminated by all the sludge on the bottom as the water supplier fills the tank and stirs it all up! Smelly or discoloured water ? Dead birds, possums or rodents in your water tank ? Or just an abnormal smell ? Every so often pollens, dead animals and enviromental factors can cause the water in your water tank to become discoloured and/or smelly. One way of removing any bacteria that may be present in these situations is to have select home services come by and steralise your water tank for you, removing any bacteria, odour and nasty taste. The products we choose to use at select home services are completly safe and used in the correct and safe manner. Another way to solve similar issues if you are not so keen on using products such as these is to perform a drain and clean.